Leukemia, Myeloid; T-Lymphocytes; Immunophenotyping; Antigens; Patient Outcome Assessment. Objectives: To evaluate the impact of myeloid antigen expression on complete remission (CR), event-free survival (EFS), and overall survival (OS) in patients with T-cell acute lymphoblastic leukemia (T-ALL) treated with intensive chemotherapy. Methods: We retrospectively reviewed consecutive patients diagnosed with T-ALL and treated in Sultan Qaboos University Hospital and Royal Hospital in Oman between 2004 and 2010. The diagnosis of T-ALL was established using French-American-British classification or World Health Organization criteria. Patients were considered having myeloid antigen expression if they expressed CD13, CD33, or both (My+ and My–). Results: Of the 39 patients, 38 were included in the study (25 patients with My– and median age of 18.4 years, 13 patients with My+ and median age of 22.0 years). Median follow-up was 12 months. Thirty-two out of the total cohort were eligible for response-rate assessment. Twenty-nine patients (90.6%) achieved CR with one or two courses of chemotherapy with similar CR rates between the two groups (p = 0.880). Twenty-five percent (5/20) of the patients with My– required two courses of induction, whereas 58.3% (7/12) of My+ required two courses of induction and the difference was statistically significant (p = 0.040). In the multivariable analysis; age, gender, initial white blood cell count, central nervous system disease, and myeloid antigen expression were not statistically significant predictors of CR. The EFS and OS were similar between the My+ and My– groups p = 0.180 and p = 0.440, respectively. Conclusions: Patients with T-ALL with myeloid antigen expression need more courses of induction; however, rates of CR, EFS, and OS are not different from those without myeloid antigen expression. Larger prospective studies are required to confirm these findings. Various patient-specific, disease-associated, and therapy-related factors have been studied as potential prognostic indicators in patients with acute lymphoblastic leukemia (ALL). One of the earliest factors assessed is the impact of myeloid antigen expression.1 Pui et al,2 studied 267 pediatric patients with ALL that were treated with standardized combination chemotherapy and reported that expression of myeloid antigens had no effect on complete remission (CR) and event-free survival (EFS). In Oman, there are no studies that assessed prognostic factors in T-ALL. 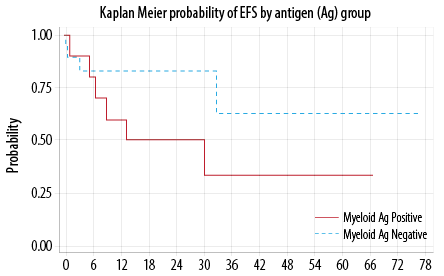 The significance of myeloid antigens has not been evaluated, and therefore, its prognostic value is uncertain. The objective of this study was to evaluate the impact of aberrant myeloid antigen expression on CR, EFS, and overall survival (OS) in patients with T-ALL treated with intensive chemotherapy. A retrospective review of clinical details and laboratory results of patients diagnosed with T-ALL and treated in two main tertiary care centers (Sultan Qaboos University Hospital (SQUH) and Royal Hospital (RH)) was performed. The study period included all patients diagnosed and treated between January 2004 and November 2010. All patients were ≥ 11 years old. The rationale for the age of 11-years was that patients older than 10-years are in a less favorable risk category and myeloid antigen expression was hypothesized to be one of the factors contributing to this risk. The medical records reviewed were patients’ demographics, white blood cells (WBC) count at diagnosis, presence of mediastinal lymph node involvement, central nervous system (CNS) involvement, baseline immunophenotype, response to induction chemotherapy, and survival. The diagnosis of T-ALL was established as per the French-American-British classification (FAB) or the World Health Organization (WHO) criteria.7,8 Patients were considered having myeloid antigen expression if they expressed CD13, CD33, or both on at least 20% of diagnostic blasts. Myeloperoxidase (MPO) was negative in all patients, and therefore, was not included in the study. Patients diagnosed with mixed phenotype acute leukemia (MPAL) were also excluded. Institutional protocols used in treatment of patients enrolled in this study included MRC UKALL in 16 patients, Hyper-CVAD in 12 patients, BFM 95 in six patients, POG9404 in three patients, and GMALL05/93 in two patients.9–13 Intensification after remission, CNS prophylaxis, and maintenance therapy were administered according to the respective protocol. Five out of 16 patients who failed first line induction therapy using UKALL protocol were shifted to Hyper-CVAD. One out of six patients who failed first line induction therapy using BFM 95 was shifted to Hyper-CVAD. One out of six patients who failed first line induction therapy using BFM 95 was shifted to POG9404. Two of the patients were managed by palliative care alone. The remaining five patients did not have complete detailed records of their treatment. CR was defined as blasts < 5% of total nucleated cells seen in bone marrow aspirate (BMA). Relapse was defined as reappearance of ≥ 5% blasts in BMA. Supportive therapy with prophylactic antimicrobials and blood transfusion were given as per hospitals’ policies. Thirty-nine consecutive patients were diagnosed with T-ALL during the study period. One patient had to be excluded due to lack of immunophenotyping details and only 38 patients were included in the analysis. Thirteen patients were My+ at the time of diagnosis, while 25 were My–. In this study, median follow-up was 12 months (0.2–39.0) for all patients and 14 months for patients still alive at the last study follow-up. Seven patients were not assessed for response to induction therapy or EFS. Two of them had poor performance status and only received palliative care. The remaining five patients left against medical advice and had no bone marrow examination data and thus were excluded from CR assessment and EFS analysis. Presenting clinical and laboratory features of both My+ and My– groups were summarized in Table 1. SD: standard deviation; FBC: full blood count; Hb: hemoglobin; WBC: white blood cells; CNS: central nervous system; CD: cluster of differentiation; TdT: terminal deoxynucleotidyl transferase. Thirty-two out of the total cohort were eligible for response-rate assessment after induction therapy and 29 patients (90.6%) achieved CR with one or two courses of chemotherapy. Patients with My+ achieved a CR rate of 91.6% (11/12 cases) while patients with My– achieved a CR rate of 90.0% (18/20 cases) with a non-significant difference (p = 0.880). Fifty-eight percent (7/12 cases) of patients with My+ required two courses of induction chemotherapy to achieve CR as compared to 25.0% (5/20 cases) with My– (p = 0.040). In multivariate analysis, there was no statistically significant predictor of CR. Out of the three patients (9.3%) who had primary refractory disease, the first patient died due to severe sepsis, the second died due to intracranial hemorrhage, and the third had no documented cause of death. Forty-one percent (13/32) relapsed or died. The median time for EFS was not reached. The probability of EFS at 12 months was 73.0% (95% CI, 51−86%). There was no statistically significant difference in the EFS between My+ and My– groups (p = 0.180) [Figure 1]. In multivariable analysis, none of the included factors were statistically significant contributor. Figure 1: Event free survival (EFS). CNS disease at presentation favorably impacted the OS (p = 0.030). Figure 2: Overall survival (OS). A number of prognostic factors have been shown to impact the prognosis in patients with T-ALL. These include age at presentation, gender, WBC at diagnosis, presence of a mediastinal mass, CNS involvement as well as cytogenetic, and molecular and immunophenotyic profile.15 We found no impact of patient’s age, gender, initial WBC, or My+ on CR, EFS, or OS. However, we found that myeloid antigen expression affects the number of induction cycles needed to achieve remission. Several trials demonstrated a relationship between initial WBC and the outcome. For instance, in the Pediatric Oncology Group (POG) study, patients with WBC < 10 × 109/L or > 50 × 109/L did worse than patients with WBC of 10–50 × 109/L.21 In UKALL XII/ECOG 2993 trial, T-ALL patients with presenting WBC > 100 × 109/L had only slightly inferior survival (p = 0.030).20 In our study, initial WBC did not affect the outcome. Impact of aberrant myeloid antigen expression has been debatable over the last few decades. Some studies24 reported its association with worse outcome; while others25 showed no influence on prognosis. We found no statistically significant association between expression of any myeloid-associated marker and CR achievement. Similar findings were reported by UKALL XII/ECOG trial,20 but not by GIMEMA study5 where expression of CD33 expression had an adverse effect on achieving CR. Of note, a higher proportion of patients in the My+ group required more than one induction course to achieve CR than My– group. However, this effect did not remain significant in multivariable analysis. Whether this was secondary to the small sample size or was affected by correlation between myeloid antigen expression and other variables is unclear. Likewise, none of the co-expressed myeloid antigens affected OS or EFS rates. This finding is compatible with the results of GIMEMA study,5 but not with the UKALL XII/ECOG 2993 trial,20 where significantly fewer CD13 (but not CD33) positive patients survived at five years. 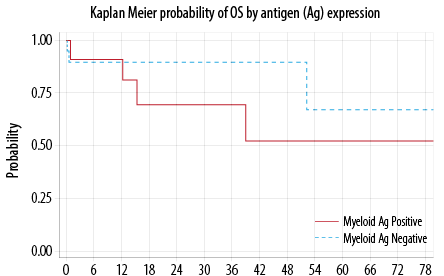 T-ALL patients with aberrant myeloid antigen expression need more courses of induction chemotherapy, however, rates of CR, EFS, and OS are not different than those without myeloid antigen expression. The study is limited by the small sample size and short follow-up time. Larger prospective studies are required to confirm these findings. 1. Pui CH, Evans WE. Treatment of acute lymphoblastic leukemia. N Engl J Med 2006 Jan;354(2):166-178. 2. Pui CH, Rubnitz JE, Hancock ML, Downing JR, Raimondi SC, Rivera GK, et al. Reappraisal of the clinical and biologic significance of myeloid-associated antigen expression in childhood acute lymphoblastic leukemia. J Clin Oncol 1998 Dec;16(12):3768-3773. 3. Sobol RE, Mick R, Royston I, Davey FR, Ellison RR, Newman R, et al. Clinical importance of myeloid antigen expression in adult acute lymphoblastic leukemia. N Engl J Med 1987 Apr;316(18):1111-1117. 4. Al Khabori M, Samiee S, Fung S, Xu W, Brandwein J, Patterson B, et al. Adult precursor T-lymphoblastic leukemia/lymphoma with myeloid-associated antigen expression is associated with a lower complete remission rate following induction chemotherapy. Acta Haematol 2008 Oct;120(1):5-10. 5. Vitale A, Guarini A, Ariola C, Mancini M, Mecucci C, Cuneo A, et al. Adult T-cell acute lymphoblastic leukemia: biologic profile at presentation and correlation with response to induction treatment in patients enrolled in the GIMEMA LAL 0496 protocol. Blood 2006 Jan;107(2):473-479. 6. Gökbuget N, Arnold R, Buechner Th. Intensification of induction and consolidation improves only subgroups of adult ALL: analysis of 1200 patients in GMALL study 05/93 [abstract]. Blood 2001;98:802a. 7. Bennett JM, Catovsky D, Daniel MT, Flandrin G, Galton DA, Gralnick HR, et al. Proposed revised criteria for the classification of acute myeloid leukemia. A report of the French-American-British Cooperative Group. Ann Intern Med 1985 Oct;103(4):620-625. 8. Swerdlow SH, Campo E, Harris NL, Jaffe ES, Pileri SA, Stein H, et al. WHO Classification of Tumours of Haematopoietic and Lymphoid Tissue. 4th ed. Lyon, France: IARC; 2008. 9. Rowe JM, Buck G, Burnett AK, Chopra R, Wiernik PH, Richards SM, et al; ECOG; MRC/NCRI Adult Leukemia Working Party. Induction therapy for adults with acute lymphoblastic leukemia: results of more than 1500 patients from the international ALL trial: MRC UKALL XII/ECOG E2993. Blood 2005 Dec;106(12):3760-3767. 10. Thomas DA, Cortes J, O’Brien S, Pierce S, Faderl S, Albitar M, et al. Hyper-CVAD program in Burkitt’s-type adult acute lymphoblastic leukemia. J Clin Oncol 1999 Aug;17(8):2461-2470. 11. Möricke A, Reiter A, Zimmermann M, Gadner H, Stanulla M, Dördelmann M, et al; German-Austrian-Swiss ALL-BFM Study Group. Risk-adjusted therapy of acute lymphoblastic leukemia can decrease treatment burden and improve survival: treatment results of 2169 unselected pediatric and adolescent patients enrolled in the trial ALL-BFM 95. Blood 2008 May;111(9):4477-4489. 12. Matloub Y, Asselin BL, Stork LC, Davidas M, Sather H, Nachman J, et al. Outcome of children with T-cell acute lymphoblastic leukemia (T-ALL) and standard risk (SR) features: results of CCG-1952, CCG-1991 and POG 9404 (abstract). Blood 2004;104(11):680. 13. Hoelzer D, Gökbuget N, Digel W, Faak T, Kneba M, Reutzel R, et al. Outcome of adult patients with T-lymphoblastic lymphoma treated according to protocols for acute lymphoblastic leukemia. Blood 2002 Jun;99(12):4379-4385. 14. StataCorp. Stata: Release 11. Statistical Software. College Station, TX: StataCorp LP; 2009. 15. Perbellini O, Scupoli MT. Adult T-cell acute lymphoblastic leukemia: prognostic impact of myeloid-associated antigens. Expert Review of Hematology 2009 Feb; 2(1):27-29. 16. Boucheix C, David B, Sebban C, Racadot E, Bené MC, Bernard A, et al; French Group on Therapy for Adult Acute Lymphoblastic Leukemia. Immunophenotype of adult acute lymphoblastic leukemia, clinical parameters, and outcome: an analysis of a prospective trial including 562 tested patients (LALA87). Blood 1994 Sep;84(5):1603-1612. 17. Yanada M, Jinnai I, Takeuchi J, Ueda T, Miyawaki S, Tsuzuki M, et al. Clinical features and outcome of T-lineage acute lymphoblastic leukemia in adults: a low initial white blood cell count, as well as a high count predict decreased survival rates. Leuk Res 2007 Jul;31(7):907-914. 18. Czuczman MS, Dodge RK, Stewart CC, Frankel SR, Davey FR, Powell BL, et al. Value of immunophenotype in intensively treated adult acute lymphoblastic leukemia: cancer and leukemia Group B study 8364. Blood 1999 Jun;93(11):3931-3939. 19. Kaleem Z, Crawford E, Pathan MH, Jasper L, Covinsky MA, Johnson LR, et al. Flow cytometric analysis of acute leukemias. Diagnostic utility and critical analysis of data. Arch Pathol Lab Med 2003 Jan;127(1):42-48. 20. Marks DI, Paietta EM, Moorman AV, Richards SM, Buck G, DeWald G, et al. T-cell acute lymphoblastic leukemia in adults: clinical features, immunophenotype, cytogenetics, and outcome from the large randomized prospective trial (UKALL XII/ECOG 2993). Blood 2009 Dec;114(25):5136-5145. 21. Schultz KR, Pullen DJ, Sather HN, Shuster JJ, Devidas M, Borowitz MJ, et al. Risk- and response-based classification of childhood B-precursor acute lymphoblastic leukemia: a combined analysis of prognostic markers from the Pediatric Oncology Group (POG) and Children’s Cancer Group (CCG). Blood 2007 Feb;109(3):926-935. 22. Kantarjian HM, O’Brien S, Smith TL, Cortes J, Giles FJ, Beran M, et al. Results of treatment with hyper-CVAD, a dose-intensive regimen, in adult acute lymphocytic leukemia. J Clin Oncol 2000 Feb;18(3):547-561. 23. Uckun FM, Sather HN, Gaynon PS, Arthur DC, Trigg ME, Tubergen DG, et al. Clinical features and treatment outcome of children with myeloid antigen positive acute lymphoblastic leukemia: a report from the Children’s Cancer Group. Blood 1997 Jul;90(1):28-35. 24. Wiersma SR, Ortega J, Sobel E, Weinberg KI. Clinical importance of myeloid-antigen expression in acute lymphoblastic leukemia of childhood. N Engl J Med 1991 Mar;324(12):800-808. 25. Boldt DH, Kopecky KJ, Head D, Gehly G, Radich JP, Appelbaum FR. Expression of myeloid antigens by blast cells in acute lymphoblastic leukemia of adults. The Southwest Oncology Group experience. Leukemia 1994 Dec;8(12):2118-2126.